It’s December 1st and that can mean only one thing at The Zooniverse: our advent calendar returns! It’s time for another citizen-science-fuelled, festive charge at the unsuspecting Christmas break for many around the world. 24 digital days of fun from us to you, our lovely, lovely volunteers! It’s a fun way of saying thank you each year. To kick things off, behind door 1 is is a bit of digital wallpaper for you: a pair of galaxies made from galaxies. 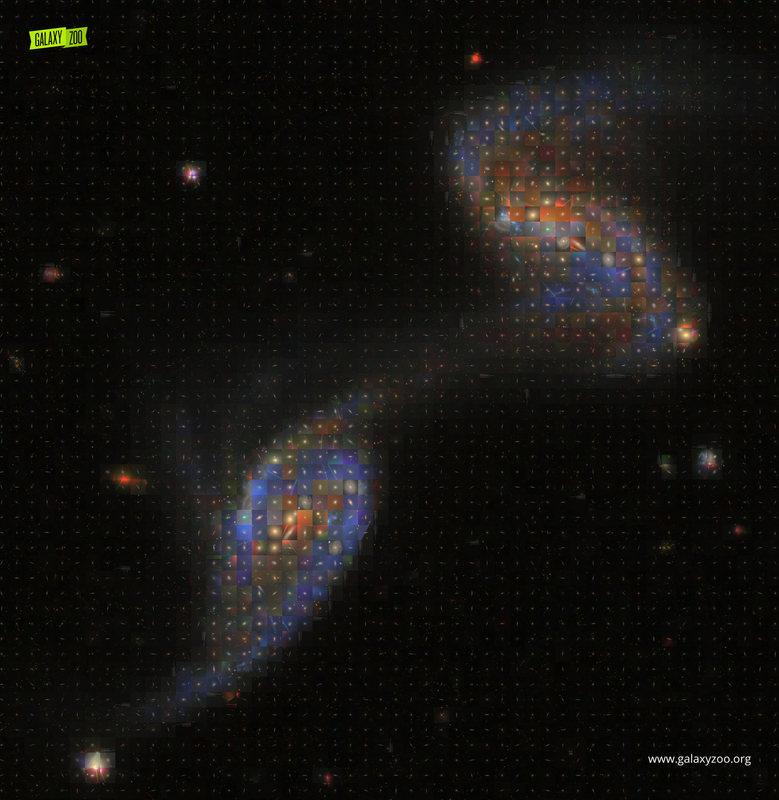 This lovely mosaic was created by Galaxy Zoo‘s Kyle Willett who was the lead author of this year’s mammoth Galaxy Zoo 2 paper. Whether it’s galaxies like these or science like this that bring you to the Zooniverse, we hope you enjoy what you find. Have a fun December, and check back on zooniverse.org/advent to see what we have behind the door each day. It seems, that the given link for the Zooniverse Advent Calendar doesn’t work. I’m confused because that is the same link! Did you find a different broken link? I clicked the link in the blog post, and got “Firefox can’t establish a connection to the server at zooniverse.org.” More than once. Over several hours. Has the GPair a catalogue number? What is its SDSS number? Answering my own question: It is NGC 5257/8 aka Arp 240. So, how do I keep the “windows” visible after opening them? Previous days’ windows stay open by default, so today the Day 1 window should be fixed open.